A design that's gone full circle. Introducing a modern twist on the round shape, the Ray-Ban 2180 Classic Sunglasses in Grey. 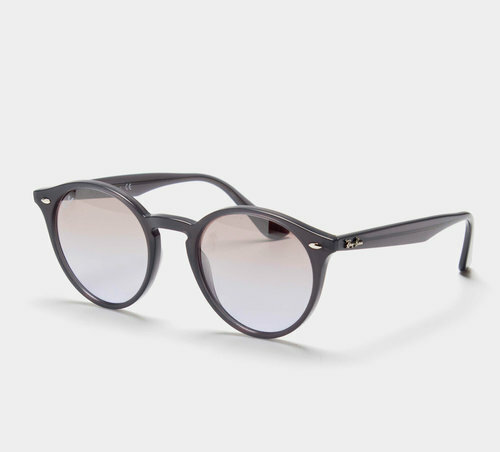 These Ray-Ban sunglasses are a nod to past styles with their distinctive round shape along with distinctive rivets and Ray-Ban shaped temples, this style features a sleek flattened bridge. With green classic lenses, 100% UV protection is given alongside ultra clear vision. Smartly presented with a grey frame with a perfect finish, these Ray-Ban sunglasses come complete with their own stylish carrying case so you can be prepared for any occasion, indoors or outdoors. Take this style around another rotation and pull on these Ray-Ban 2180 Classic Sunglasses.